We at Applanga have one mission - we want to help you optimize your localization processes. And we can’t do that without continuously optimizing our own solution. Our latest two feature updates revolve around the topic of ensuring consistency and not doing the same work over and over again. We have implemented a glossary as well as a translation memory, and would like to show you the “what, why and how” of each solution - for an even better localization workflow with Applanga. A glossary is simply a list of terms specific to a company, product or project. It is often referred to as lexicon, term base, and/or terminology collection and has one very important job: to prevent inconsistencies. This can be a tough job in one language alone, as most words have synonyms (do you want to call it a “cell phone” or a “mobile phone”, a “holiday” or “vacation”? ), but it can get majorly confusing when dealing with a number of different languages on top of that. One of our newest customers makes apps for truck drivers and had a stellar example for why a glossary is crucial for them. A truck is a lorry in the UK, and can be translated in a number of different ways into other languages. German alone offers “Lastwagen”, “Güterwagen”, “Karre”, “Transporter” and “Lastauto”, to only name a few. 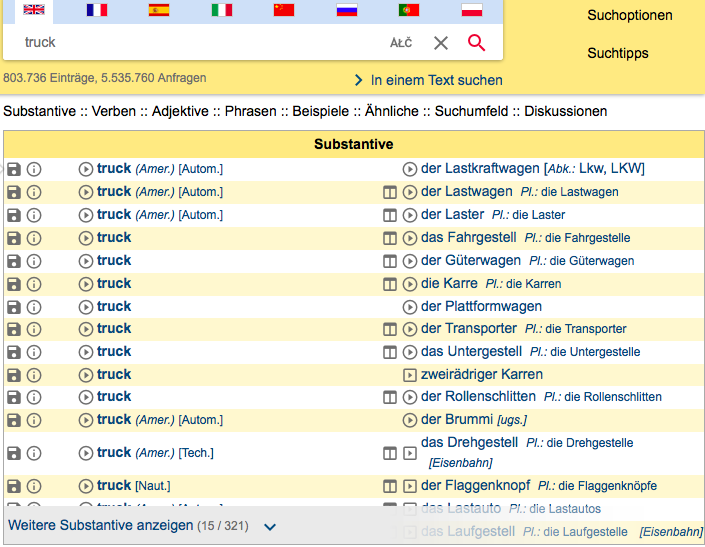 Depending on who handles a translation job, truck could appear to be translated in different ways on different screens of the app - imagine the confusion! Or how about a brand name such as “target” (the big supermarket chain in the US), they surely wouldn’t want to end up being called “Ziel” in German and would need to make sure their brand name will never be translated. Of course it helps to give your translators a lot of context, and we have an entire blog on that topic as well, but a Glossary will be necessary for almost every localization project. According to the big localization service provider Lionbridge, approximately 15% of all translation project costs arise from rework. And what is the primary cause of rework? You got it, it’s inconsistent terminology. You could, of course, manage your glossary on a shared file (like google drive), and switch between the browser tabs while working, but wouldn’t it be much better to have the glossary integrated into your localization tool? Applanga create your glossary and manage it through the dashboard. 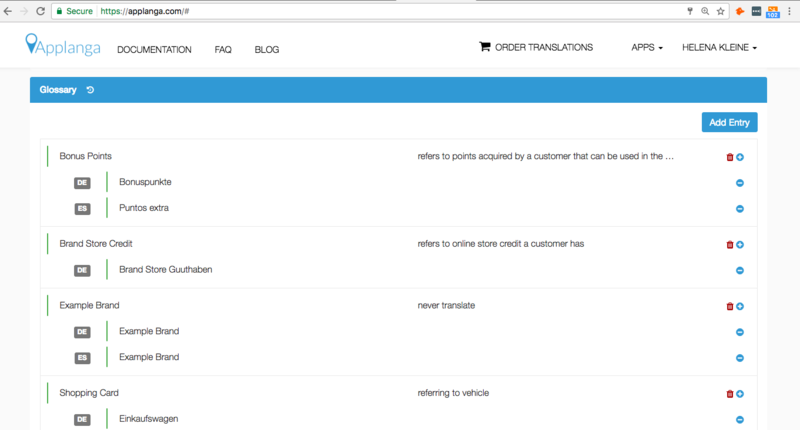 If a term is translated differently than specified by the glossary, your translator will get a notification automatically and can fix it right away. The glossary can be shared across different projects and ensure consistency throughout all of your apps. Talk to us to get a live demo and get more information. Similar to the glossary, a translation memory is a place to store strings and their corresponding translations per language. These string pairs can be words, but also segments of a sentence, entire sentences or paragraphs that have previously been translated. By collecting translations in such a way, human translators can be aided as they no longer have to translate common words and phrases over and over again. Not only does it save them valuable time, it also minimizes the risk for human errors and, once again, ensures consistency. Your projects will be completed faster, have better quality and secure customer satisfaction. To build up a proper database of translated phrases will take some initial time and effort, but it will be way worth it down the road. We have, of course, tried to make the process as simple and straightforward as possible. After reviewing and approving a set of translations, and thus making sure they meet the standards and requirements for your project, you have the option to add all or only a selection of strings to your translation memory database hosted within the Applanga platform. It makes most sense to add common phrases that will most likely be translated in a similar manner every time. After adding translations to the memory, they will wait there ready to be re-used. When a new set of untranslated strings comes in, your first action can be selecting them in bulk and using the “Translate from Memory” action. If a new source string matches an entry in the translation memory, the stored translation will be applied as a draft. This can save hours right off the top of your localization process. Naturally, your translators still need to review each string carefully and ensure the automatic translation is indeed a fitting one for the particular case and context, but at least they won’t have to translate the same pieces of content over and over again. Your translation memory will grow after each iteration of the process and become more and more helpful with time. Contact us to get our personalized tips on how to make use of this feature!